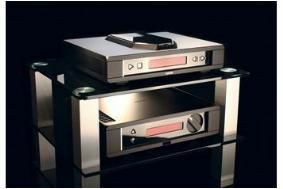 BRISTOL SHOW 2010: See Rega's new flagship Isis CD player and Osiris amp | What Hi-Fi? The first models in the line-up are the Rega Isis CD player and Rega Osiris stereo amplifier, selling for £5998 each. The Isis is Rega's seventh-generation CD player. It uses two Burr Brown PCM1794 DACs, running in parallel dual mono mode, driving a high-performance discrete Class A current-to-voltage amplifier. Rega claims this generates "an exceptionally wide dynamic range, low distortion and linear signal". The analogue circuit is fully balanced from the DACs to the balanced analogue XLR outputs. Meanwhile, the digital section of the Isis is based on that used in Rega's Saturn model, with improvements to the mechanism, optical ampliifer, DSP core, PLL, master clock and motor power supplies. A USB input is also fitted to the Iris for connection to a PC. Rega describes the partnering Osiris as "a high-performance, 162W dual-mono amplifier housed in a custom Rega CNC machined aluminium case with high thermal efficiency heat sinks". Designed around a 'minimalist' high-gain power amplifier and passive pre-amplifier circuit topology, a passive volume control and a single stage of power amplification between the input and speakers, Rega says the Osiris offers "unrivalled performance and build quality". You can see see both flagship models in rooms 418 and 420 here at the show. Full details on the show website.